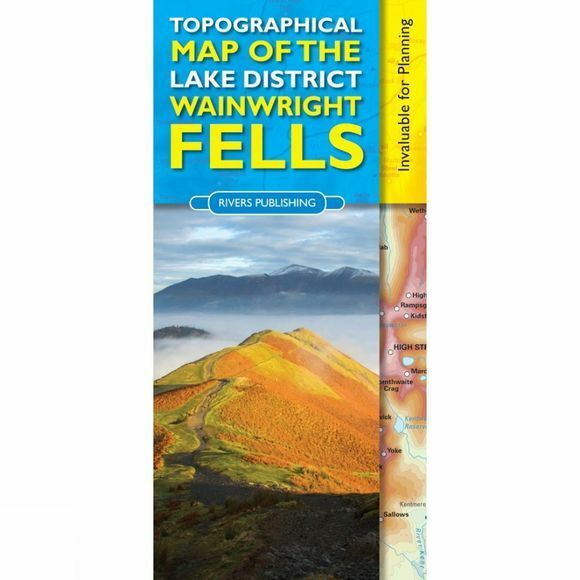 This map shows all of the 214 Wainwright Fells of the Lake District very clearly on a high quality topographical base map. It will especially appeal to those walkers who are aiming to climb all the Wainwright Fells and want a clear, user-friendly aid to plan their trips and to mark off the fells as they do them. The map has been carefully designed to show essential detail as clearly as possible, whilst leaving off the things of less relevance (including footpaths) that would otherwise clutter the map. The result is a map of the Lake District that is one of the clearest, most legible and elegant maps available today. The base map is a detailed topographical map (based on OS geodata) that shows – towns, villages, roads, railways, stations, ferry crossings, youth hostels, campsites, rivers, lakes and mountains. Topographical relief is shown by graduated colour layers with a 50-metre contour interval. Each Wainwright summit is clearly labeled with the fell name together with a small circle so that you can mark off a peak when you have done it. Popular starting and parking places are shown with a small blue dot to further aid planning routes. Place and fell names are easily legible. The map is a convenient size so that it is easy to use – either opened out on a table, in the car, or when displayed on the wall. The map is printed on high quality paper. On the reverse of the map are tables and lists of the 214 Fells, with their heights with a wide column so the user can record the date climbed and personal notes. There is also helpful information on recommended books and web sites. Rivers Publishing is a well established, specialist publisher based in the Lake District. Over the last twenty years they have built up a reputation for best-selling, quality guide books and maps.